In a new survey, 52% of Americans said the presidential election is a "significant source of stress" in their lives. The presidential election dominates the news cycle for several months once every four years—but if 2016's intensely hostile contest has left you feeling more anxious than usual, you're far from alone. 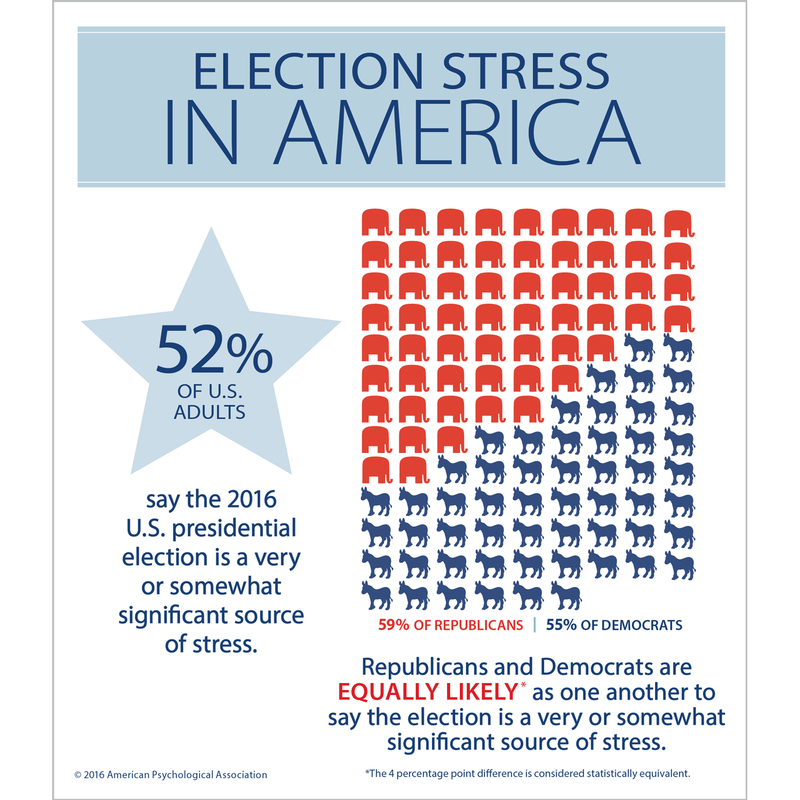 In a survey released Thursday by the American Psychological Association (APA), 52% of American adults report the election as a significant source of stress in their lives. The findings are part of the APA's Stress in America Survey, an online Harris Poll of 3,511 adults living in the U.S. It's conducted annually to examine how stress affects the health and well-being of American adults. The Washington Post reports that the APA included a question in the annual survey about the election, and released those results early. According to the survey, men and women are equally likely to be feeling election-related anxiety. And it turns out that this type of stress is bipartisan: 59% of Republicans and 55% of Democrats say they have it. Age, however, does seem to play a factor. Millennials and people 71 or older are more likely to say the election is a significant source of stress than Baby Boomers and Gen X'ers. The survey also found that people who report that the election is a source of stress have a higher overall stress level than those who don't find the election stressful. There are some steps you can take to ease your election anxiety, the APA says. First of all, maybe consider taking a social media vacation (check out our guide to quitting Facebook). Survey respondents who use social media were more likely to be stressed out by the election than those who steer clear of Facebook, Twitter, and the like. “Election stress becomes exacerbated by arguments, stories, images and video on social media that can heighten concern and frustration, particularly with thousands of comments that can range from factual to hostile or even inflammatory,” said Lynn Bufka, PhD, APA’s associate executive director for practice research and policy, in a press release. If the 24-hour news cycle of claims and counterclaims from the candidates is causing you stress, limit your media consumption. Read just enough to stay informed. Turn off the newsfeed or take a digital break. Take some time for yourself, go for a walk, or spend time with friends and family doing things that you enjoy. Avoid getting into discussions about the election if you think they have the potential to escalate to conflict. Be cognizant of the frequency with which you're discussing the election with friends, family members, or coworkers. Stress and anxiety about what might happen is not productive. Channel your concerns to make a positive difference on issues you care about. Consider volunteering in your community, advocating for an issue you support, or joining a local group. Remember that in addition to the presidential election, there are state and local elections taking place in many parts of the country, providing more opportunities for civic involvement. Whatever happens on November 8, life will go on. Our political system and the three branches of government mean that we can expect a significant degree of stability immediately after a major transition of government. Avoid catastrophizing, and maintain a balanced perspective. Vote. In a democracy, a citizen's voice does matter. By voting, you will hopefully feel you are taking a proactive step and participating in what for many has been a stressful election cycle. Find balanced information to learn about all the candidates and issues on your ballot (not just the presidential race), make informed decisions and wear you "I voted" sticker with pride.